Whale−watching crews are enthusiastic about rare sightings, but members believe the unexpected arrivals are likely linked to warmer ocean temperatures. A short-beaked common dolphin leaps from the waters of the Salish Sea during a whale-watching expedition in Port Angeles, Wash. on Sat. June 11, 2016. Photo by Canadian Press. A Seattle−based ecotourism group says the effects of global warming may be responsible for a unique sighting in the usually chilly northwest coast waters of the Salish Sea, south of Victoria. 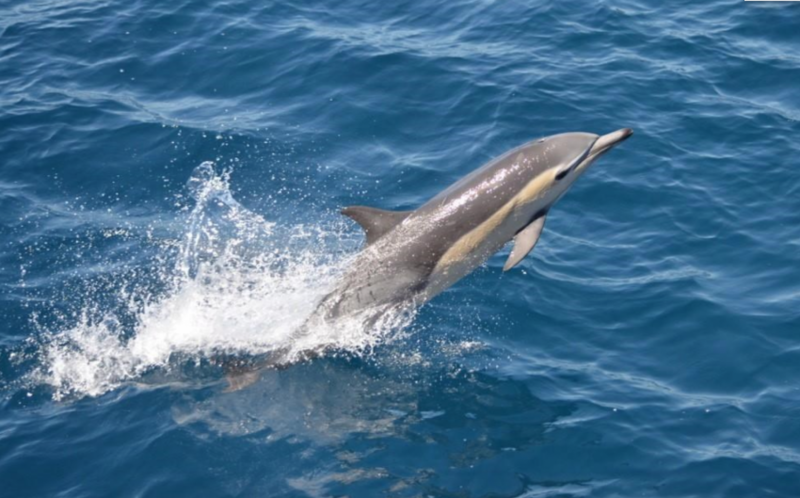 The Pacific Whale Watch Association says people aboard a whale watching expedition off Port Angeles, Wash., on Saturday saw a small school of what are believed to be short−beaked common dolphins. The dolphins rarely venture north of California, and a naturalist aboard the expedition snapped a photo when she realized the creatures were not their Pacific white−sided cousins, found along the Washington state and B.C. coasts. If the school is confirmed, association officials say it could be the first−ever sighting of the speedy mammals in the Salish Sea, around the southern tip of Vancouver Island. The association says a number of short−beaked common dolphins were spotted off the B.C. coast last September, but those two schools were about 75 kilometres southwest of Vancouver Island near the continental shelf. Executive director Michael Harris says that while whale−watching crews are enthusiastic about rare sightings, members believe the unexpected arrivals are likely linked to warmer ocean temperatures. "They’re beautiful animals and we’re thrilled to get a chance to observe and study them, but at the same time we know that if our oceans were healthier and this planet weren’t in the throes of a climate crisis we probably wouldn’t be seeing this species up here," Harris says. Short−beaked common dolphins can grow to 2.5 metres and reach speeds of up to 60 kilometres per hour, making them among the fastest animals in the ocean. The association reports growing numbers of unique sightings, including the endangered north Pacific right whale. A sub−tropical green sea turtle was nursed back to health at the Vancouver Aquarium after being washed ashore on Vancouver Island’s west coast in January.